Genuine Datacard 534000-009 YMCKK color ribbon. 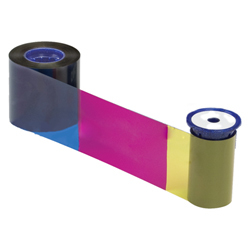 Datacard 534000-009 YMCKK ribbons consist of yellow (Y), magenta (M) and cyan (C) panels for printing a full spectrum of colors by combining the colors using varying degrees of heat. The two K panels are black resin, typically used for printing text and barcodes. Datacard 534000-009 YMCKK ribbons are for dual-sided printing, with YMC and the first K panel printing on the front side, the second K panel prints on the back side of the card. Datacard recommends using only Datacard Certified supplies to protect your ID card printer investment and ensure brilliant image quality, high security, and exceptional performance. The Datacard 534000-009 has replaced the Datacard 552854-510 ribbon.